As renters, you need to take control of your home security, but you may not have as many options as a homeowner. Despite the fact that you do not own the property, you can still make some changes to mitigate home security risks. Talk to the landlord to find out what liberties you do have, and to address any potential security concerns you have before signing your lease or rental agreement. Unless you have verifiable proof from the landlord that the locks were changed after the previous tenant left, request that the locks be changed. 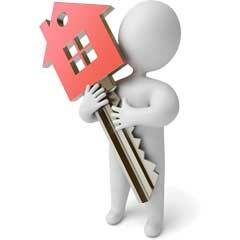 If they haven’t been changed, there is no guarantee previous tenants turned in their copies of the keys. Previous tenants may have also given copies of the keys to their friends and loved ones. If the landlord will not change the locks, consider changing them yourself and providing a copy of the key to the landlord or property manager. There are many wireless security systems available on the market today that can be installed without causing damage to walls or wiring in a rental property. Always check with the landlord prior to installing the system, but many systems are easy to install yourself and even come with professional monitoring. Many systems are available, so research the market to find the option that will work best for your particular security needs and concerns before making an investment. Many include additional features, which depending on your particular concerns, may not be necessary. As a renter, a timed light system can be particularly helpful in deterring burglary. If you are away from home for an extended period of time, using a timed light system will make it appear as though someone is in the home at all times. You may even be able to find software for your computer that will allow you to control your lights away from home and schedule them in advance. Burglars often call a home before attempting to break in. If you do not answer the phone, it is a signal that you are not home. Forwarding your calls allows you to answer them even when you are away. Consider installing multiple wireless video cameras throughout your apartment. These can be self-monitored with remote video access either through your laptop, tablet, or smartphone. Video cameras are particularly helpful as you may never really know who enters your apartment on the landlord’s behalf. There are several systems available on the market today, so research to find the one that works best for your needs. Renter’s insurance follows a similar concept as homeowner’s insurance. If you lose property due to theft, it is typically not covered by any insurance your landlord is required to carry. Purchasing renters insurance will help protect your valuables from theft. Usually the cost of the insurance itself is much less than the value of the property within the rental home. In many cases, you can get renter’s insurance through your auto insurance company and qualify for a multi-policy discount to make it even more affordable.